Before we share the best wedding venues in Chicago, let me state a quick fact: Couples getting married in Chicago are lucky. Some of the nation’s best wedding venues are in Chicago. There’s tons to choose from to host your dream wedding. 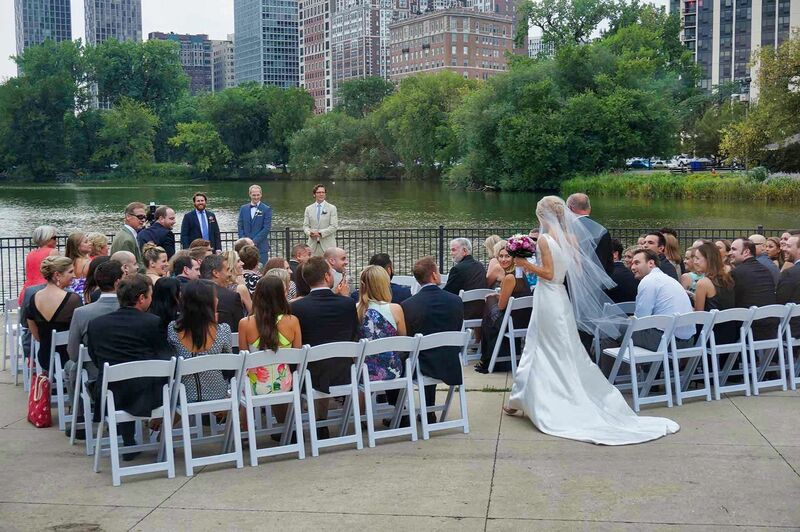 From open waterfront venues, gorgeous mansions, and fun public settings like the Zoo… it makes creating a list of the best wedding venues in Chicago easier said than done. You can really let your imagination run wild as you plan your big day. Your venue might be one of the biggest choices you make when planning your wedding, especially considering that this is where the whole day will take place. You want to choose a place that suites your personality, but also one that fits your guest list and budget. Luckily in Chicago, there is no shortage of wedding venues. So, how do you pick the right one? It’s important to get some planning done before you go out venue shopping. First, you want to work out your budget. How much do you think you are comfortable spending overall on your wedding and how much of that will go towards the venue? Keep in mind, some venues come with catering, rentals, etc. while others don’t. This will also factor into the cost. Write out a list of questions that you want to know regarding what is included and take this with you. If you’re going for something more cost-friendly, a garden setting such as a park or a public setting, such as an auditorium or by the lake might suit you better. If you want to go all out, then you know you can afford a beach resort, fancy hotel, or mansion wedding. You want to have a good idea of what you can afford before going out and falling in love with a venue. Lastly, write out your guest list before you go venue shopping. Remember that about 10% of people will decline. You want to pick a venue that will fit the right amount of people, because having too many people will mean you have to turn people away and having too little people might mean you have to pay for those empty seats. Now, where to start looking? Here’s our list of the best wedding venues in Chicago. Big glass windows overlook Lake Michigan, with an elegant vibe perfect for saying “I do”. Say your vows with the fresh breeze on your back, and enjoy the sunset as the party gets started. This gorgeous estate was built in the 1920s as a Masonic Temple, which is what gives it the charming décor and old 20s vibe. The word “mansion” might sound expensive, but this option is actually quite budget friendly. Take one look at the Crystal Ballroom and try and catch your breath. Romantic and breathtaking, you won’t forget a night spent here. If you want a stunning garden party, then the Chicago Botanic Gardens is the perfect spot. The picturesque grounds has a number of options to choose from, and you can style it however you’d like. For the more budget-friendly, Promontory Park is a great option for about 150 guests. There is an indoor and outdoor option, meaning you can enjoy an outdoor space rain or shine. This venue is stunning, and definitely different! If you’re going for an industrial-chic wedding venue, then this one is for you. It has high ceilings, tons of natural light, overhead beams and courtyard for outdoor ceremonies. Really, it has it all! This venue is something special, and we specifically love the Wild Kingdon wedding setting. It gives you an outdoorsy-oasis feel while being surrounded by wildlife. But if you want more elegance, Café Brauer is the place for you. Okay, can you pick a cooler location? You can get married in the wild reef, on the stunning terrace overlooking the water, by the whales, or pet the stingrays. Your guests will absolutely love it. The design of Spiaggia is simple but elegant. It can fit up to 180 if you’re looking to dance, or 250 if you’re just having drinks. The big windows and gorgeous décor make for a perfect backdrop to any wedding or reception. 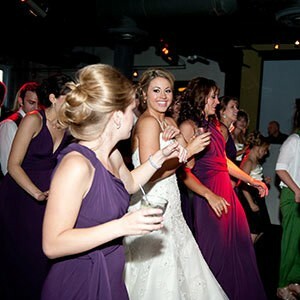 If you’re looking for a fun place to host a wedding or reception, Carnivale is the spot for you. Fitting parties of 40 all the way up to 1,000 people (yes, 1,000! ), they can make it your wedding a delicious party to remember. Well, there you have it: our picks for best wedding venues in Chicago. And when you’re ready to make more decisions about your upcoming wedding, Hot Mix Entertainment has been serving couples all over Chicago as the city’s best DJ. Learn more here.